Take one microproof bowl, add white cooking chocolates and micro for 30 sec or till melt, whisk it well and pour some into each silicon cupcake mold. Swirl them so that the chocolate coats the cups entirely. Pour out excess and keep the cups in the refrigerator to set. Once set take them out of the refrigerator and peel the silicon cupcake mold carefully. Take one bowl, add hung curd, sugar, chopped strawberry and mix well.keep into freeze. Take serving plate, arrange chocolate cup, add 2 to 3 Tablespoons strawberry yogurt, garnish with strawberry slices and black current. 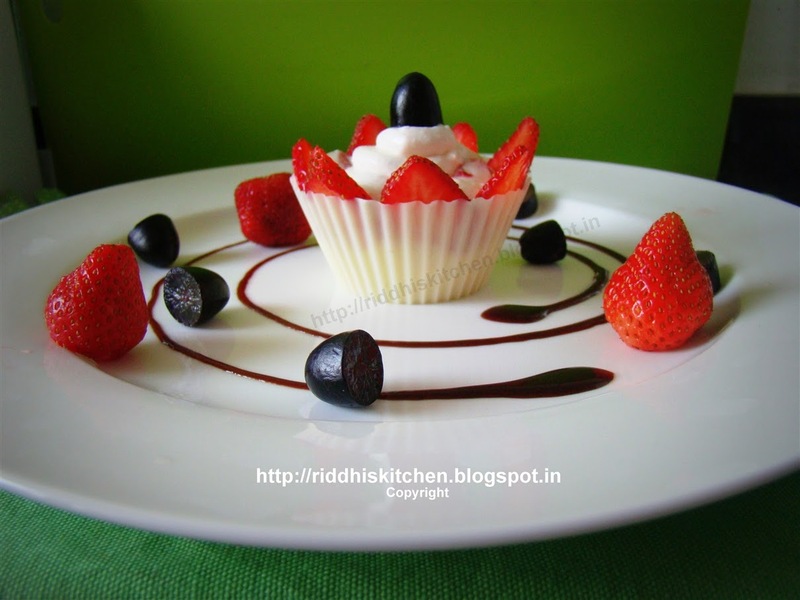 Pour chocolate sauce in plate as per your design. Garnish with whole strawberries and black current and serve chilled.